While everyone looks up to NASA for space discoveries through its powerful telescopes, like Hubble, an amateur in New Zealand has beaten NASA by discovering a new solar system with his own gadgets. The photographs are both mesmerizing and look like NASA's finds. This photograph above, shot by Rolf Olsen of New Zealand, may appear rather unremarkable at first glance, but it's quickly becoming one of the most popular space pictures of the year. 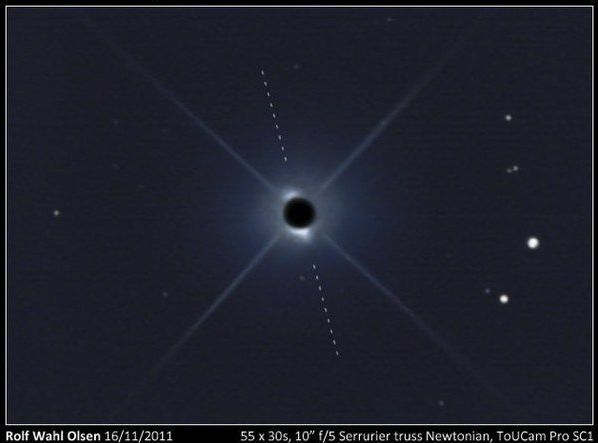 The image shows a new solar system named Beta Pictoris in its very first stages of life. Olsen's achievement marks the first time that an amateur astronomer has captured a solar system being born, and it's a feat that even professional stargazers have a difficult time capturing.